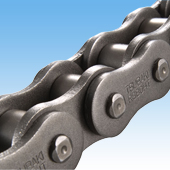 Tsubaki offers a variety of heavy duty and Super Chains to provide users with a higher maximum allowable load, high shock absorption, higher fatigue strength, and higher tensile strength than standard RS Roller Chains. This enables users to go one or two sizes down to design more compact systems. 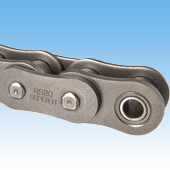 Notice: Super Chain, RS-HT, Super-H drive chains have been upgraded with higher fatigue strength. When higher transmission power, allowable tension, or tensile strength is required. e.g., Construction machinery, farm equipment, lifting mechanisms, port equipment, tower parking, etc. 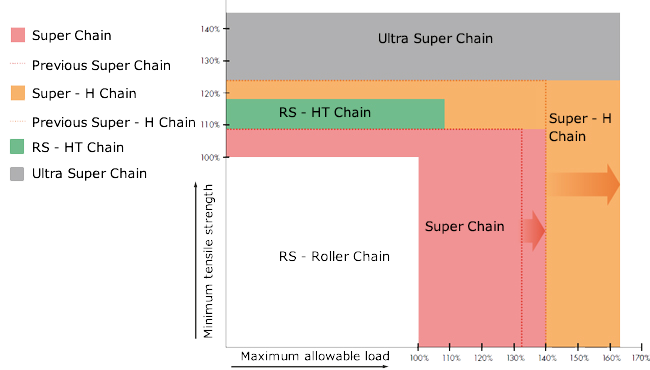 * High shock absorption * Ultra Super Chains have the highest tensile strength and shock absorption of any Tsubaki roller chain. For drives that require compact designs. 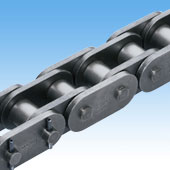 * Able to use two sizes smaller RS Roller Chain. e.g Construction machinery, farm equipment, lifting mechanisms, port equipment, tower parking, etc. 4POL can only be used for single-strand chain. Offset links are not available. Use an even number of links. Sprockets for RS Roller Chain can be used for multi-strand and single strand chain. 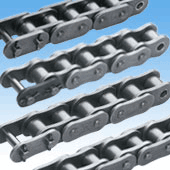 * Sprockets for RS Roller Chain can be used for single strand chain. * Sprockets for RS Roller Chain cannot be used for RS-HT multi-strand chain and Super-H Roller Chain. * Small sprockets must have hardened teeth. * Use sprockets made of S35C or higher carbon steel. * Sprockets for RS Roller Chain can be used if the usage conditions and chain size of the chain being replaced remain the same. * Tough Tooth sprockets that are optimal for Heavy Duty Chain are available. With RS Roller Chain min. tensile strength and max. allowable loads as benchmark (100%). High tensile strength (19% more than RS Roller Chain). Ideal for the less frequently used lifting applications, and low speed drives up to 50m/min. 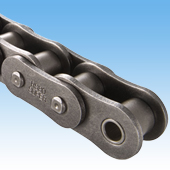 High kW ratings and shock absorption enables users to go one size down from RS Roller Chain. Has 40% higher fatigue strength than RS Roller Chain. Has the highest fatigue strength.